Algae is a common concern for many homeowners, as it grows steadily on a variety of exterior surfaces. When the conditions are damp and shady, algae can quickly pop up and spread steadily You do not need a commercial algaecide to remove the algae effectively, though. In fact, with a household bleach solution, you can quickly spray the covered surface and prevent the algae's return in under 30 minutes of work. Household bleach will fix your algae troubles. Spray surrounding shrubs and plants with water to protect them against the bleach application. You can further protect them by covering them with drop cloths. 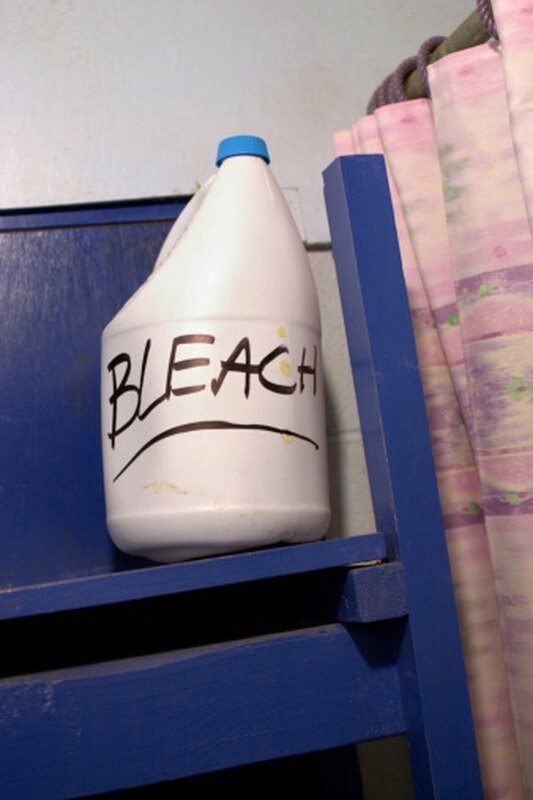 Mix one part household bleach with two parts water in a bucket. Incorporate thoroughly with a wood paint stir. Protect your hands with rubber gloves and then carefully pour the bleach and water mixture into the top of the pump sprayer. Prime the sprayer as directed in the user instructions and then hold the wand 4 to 6 inches away from the surface and coat it with the bleach solution. Wait 12 to 15 minutes for the bleach to break apart the algae. Scrub it thoroughly with a stiff nylon-bristle brush to remove. Rinse the surface free of the bleach and algae with a garden hose. You can also employ a power washer with a 40-degree fanned tip attachment.